A mezzanine floor system serves as an intermediate floor in a building that does not completely cover the entire flooring below. Mezzanines should provide plenty of clear height for foot traffic above and below the deck. In an industrial setting, the mezzanine system is often used for storage of inventory or other materials. However, mezzanine floor systems are used in a variety of environments, including commercial office space, warehouses, manufacturing facilities, car dealerships, and even breweries. Mezzanine floors can be designed to a number of different specifications including varying load ratings, layouts, deckings, railing types, etc. In a warehouse or manufacturing facility, mezzanine floor systems allow for a variety of benefits for the facility. First, the mezzanine utilizes unused space above the facility floor to be used however the facility sees fit. Whenever a facility needs to solve their space needs fast and affordably, mezzanine floors are the best solution, by effectively doubling the usable space it covers. In addition to the extra space, mezzanine floors can be installed into the facility quickly and with minimal site disruption. In comparison to stick-built, prefabricated mezzanine floors can be fabricated off-site, allowing the structure to be quickly erected on-site. Unlike stick-built construction, prefabricated steel mezzanine floors ensure there is no wasted material at the project site, making clean-up as easy as possible. All of this means the facility will have minimal downtime and increase their usable area swiftly and efficiently. What is a mezzanine floor typically used for? Mezzanines fit a number of different applications and not just in the industrial sector. The most common application for a mezzanine system is for additional storage. However, Panel Built’s mezzanine floors are highly adaptable and can be designed and fabricated to meet many more applications. In addition to extra storage space, mezzanines can provide a specialized work area for equipment or machinery in hard to reach areas. For example, Panel Built’s mezzanine systems are frequently designed to fully surround equipment. 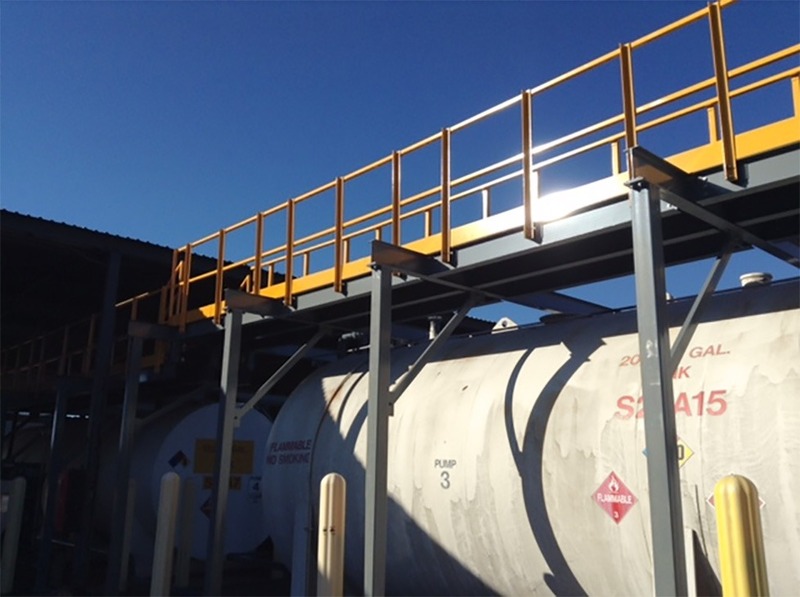 Chemical tanks, industrial pumps, sorting machines, airplanes, conveyor systems, and even space capsules are just some of the many pieces of equipment that our mezzanine systems have been fitted for. Adjustable deck heights, load ratings, and deck layouts make for easy machine maintenance and operation for your specific needs. For companies with increasing office space needs, mezzanines floors offer a perfect solution. 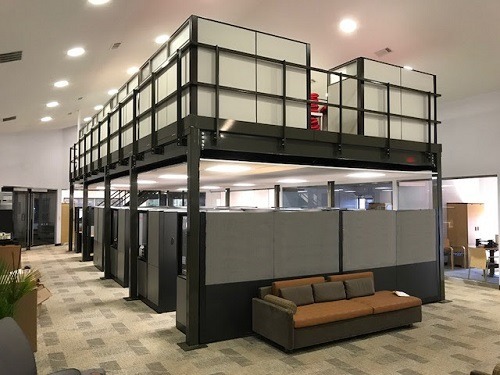 Particularly in a rapidly growing manufacturing environment, mezzanine offices provide a comfortable work environment above the facility floor that takes up a minimal amount of workspace. Typically, these buildings make the perfect supervisors office as they provide a space separate from the roaring factory, while still allowing them to keep a close eye on their work processes. A mezzanine floor can be just as useful in transportation as they are in storage. Similar to their application as work areas, mezzanines can be given unique designs to accommodate conveyor and catwalks systems. These systems offer a convenient means of transporting employees and inventory above the facility floor in order to not disturb pre-existing work areas. Additionally, the can be used to retrofit a catwalk to pre-existing mezzanine systems to connect them together. Again, one of the greatest benefits of our modular mezzanine floor systems is their ability to be custom fabricated and designed to fit the customer’s specific need. Going along with their flexibility, another great benefit of our mezzanines is the different additions to the system we can provide. With workplace safety as a main area of focus in all facilities, Panel Built offers a variety of mezzanine floor additions to ensure your new structure keeps potential hazards to a minimum. One of the most important mezzanine features is the proper use of safety gates to properly load and unload inventory and materials. First off, the mezzanine gates come in a variety of types, depending on what it will be used for. Swing gates are either one or two door designs and offer ease of use. Sliding gates provide an access point on mezzanines with restricted floor space. And pivot gates offer the most protection, ensuring one end of the gate is closed at all times. The safety gate systems main function is to act as mezzanine railing when the gate is not in use but can be easily opened to prove access to the floor. The safety gates come in a variety of sizes to fit the materials passing through it. 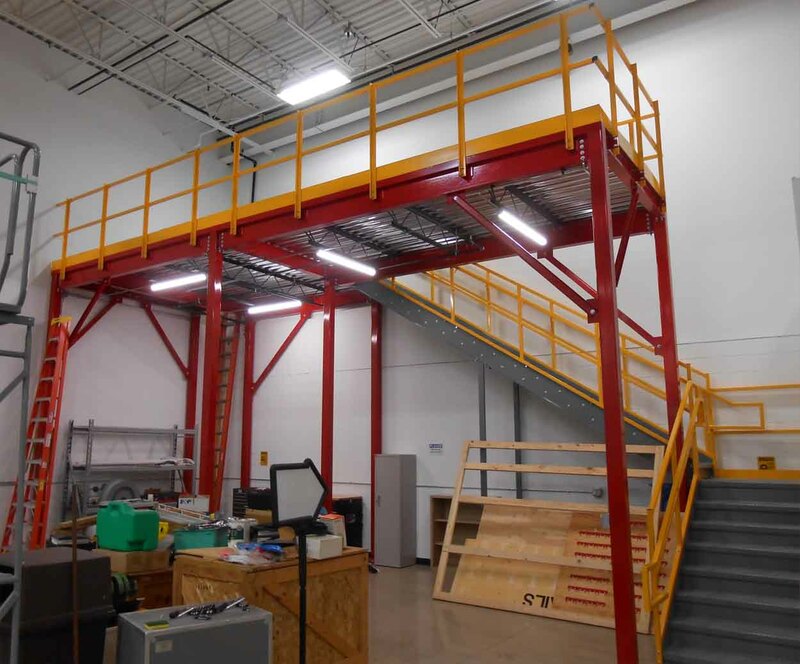 Standard industrial mezzanines will have handrailing that will conform to either IBC or OSHA code. However, Panel Built provides a variety of different options to fit your safety or aesthetic needs. In many cases, a higher safety standard will either be required by local code or by the facility itself. In these situations, Panel Built offers hand railing with a wire mesh between the base and top of the rail or even handrailing with pickets to prevent slippage underneath the railing. Aesthetically, Panel Built offers cable wiring on the stairs and the surrounding mezzanine railing. Panel Built mezzanine platforms come in one of 6 standard color options: Black, Blue, Gray, Yellow, Red, and White. However, we do provide color matching to practically any color sample you provide us. Also, Panel Built, Inc. utilizes powder coating when coloring our mezzanine systems. Powder coating provides a much more durable exterior for the mezzanine, easily cleaned and resisting scratches, scrapes, and corrosion. 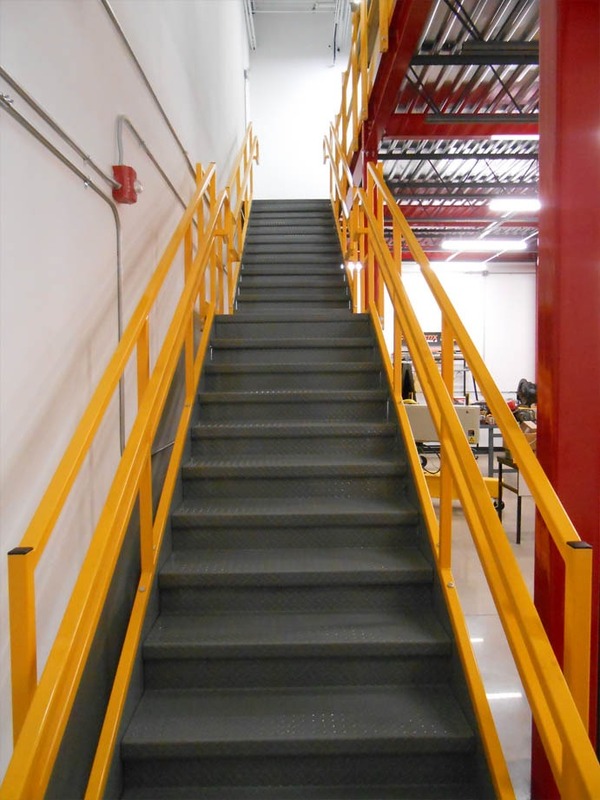 Overall, mezzanine floors are an elevated platform above a facility’s base floor. Typically, the mezzanine will be open to the rest of the facility and according to certain codes, mezzanine floor systems should not cover more than 1/3 of the facility’s floor. However, as you can see, mezzanines can fit into a variety of applications and address a number of different space needs even inside of just one facility. Panel Built, Inc. has fabricated mezzanine floors for companies and organizations in manufacturing, military, government, education, warehousing, and nearly all commercial sectors. If you are interested in learning more about our mezzanine systems, give us a call at 800-636-3873 or send us an email at info@panelbuilt.com. We are always more than happy to help answer your questions and find the right space solutions for you. Or, you can request a quote and we will put a number together for your potential project in 24-48 hours, complete with drawings, specifications, and your very own 3D fly-through of your structure.